RAD lives in a 2D grid! 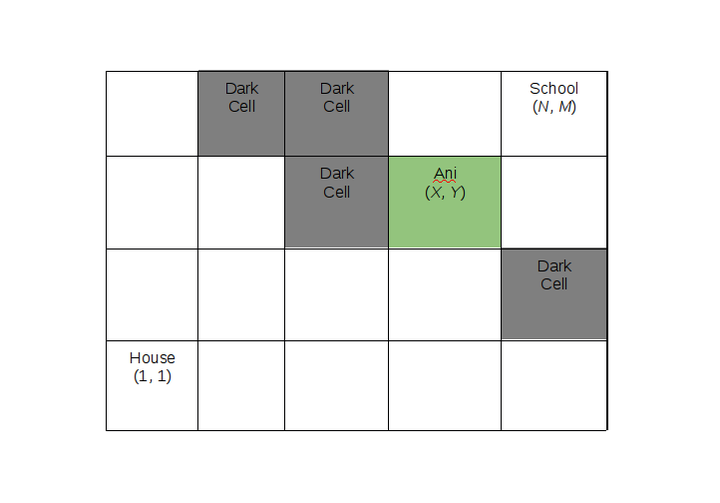 He lives in (1, 1) cell of the grid (the bottom and left most cell) and he wants to go to school which is in (N, M) cell. But he doesn't know, in how many ways he can go to school from his home. His mother told him that “RAD, you can move only right and up” and you must not visit the dark cells. RAD agrees with his mom; but he has to pick his best friend ANI who is in (X, Y) cell. It is guaranteed that (X, Y) cell is not a dark cell. So, you have to count the number of ways to go from (1, 1) to (N, M) such that (X, Y) cell is visited and no dark cell is visited. Only moves allowed are to the right and up directions. The first line of the input gives the number of test cases, T (1 <= T <= 20). First line of each test case contains two space separated positive integers N, M representing the location of the school in the 2D grid (1 <= N, M <= 50). Next line contains another two space separated positive integers X, Y representing the position of ANI (1 <= X <= N, 1 <= Y <= M). Next line contains a non negative integer K representing the number of dark cells (0 <= K <= min(50, N*M)). Each of next K lines contains two space separated integers DXi, DYi representing the dark cells (1 <= DXi <= N, 1 <= DYi <= M). RAD’s house, school and ANI -- none of them will be in dark cells. For each test case, output the number of ways RAD can go from house to school maintaining the requirements. This number can be very large so print the result module 10004.